Millions of voter-approved dollars would go annually for beach restoration, the St. Johns River and a boost to the state’s natural springs, under measures that would continue to divide up a pool of environmental preservation money. The Senate Environmental Preservation and Conservation Committee on Monday unanimously approved a pair of bills (SB 174 and SB 204) for the 2018 legislative session that would require at least $50 million a year go to beach nourishment and inlet-management projects and $50 million go toward helping restore the St. Johns River, its tributaries and the Keystone Heights lake region. 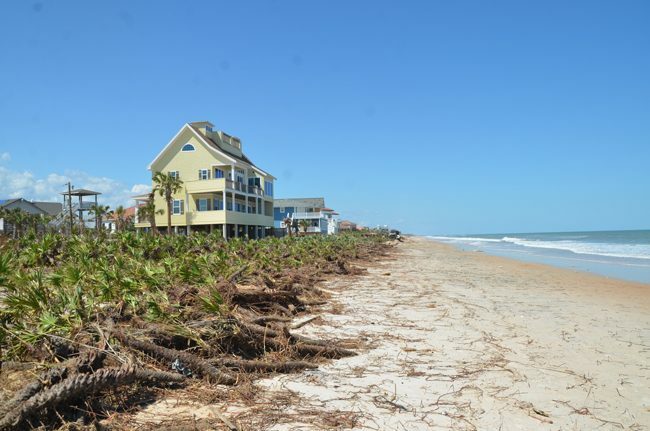 That may be good news for Flagler County, whose beaches have been ravaged by hurricanes Matthew and Irma, and whose plans had once included beach re-nourishment, until the county commission shelved that approach and took a different direction. Lack of money–and lack of certainty that federal money would be available–compelled the county to shift direction while remaining very uncertain as to the financial viability of its plans. Today’s committee results at the Legislature suggest that, if the bills survive, there may be new money for Flagler to tap into. Meanwhile, funding for the state’s natural springs would increase from $50 million a year to $75 million. The money would come from a 2014 voter-approved constitutional amendment that called for setting aside a portion of documentary-stamp taxes to go to land and water conservation. Senate Appropriations Chairman Jack Latvala, a Clearwater Republican sponsoring the beach-funding proposal (SB 174), acknowledged that lawmakers may eventually over-carve the money, which is placed in a trust fund. The real estate tax is expected to bring the trust fund $862.2 million next fiscal year, according to an August estimate by state economists. Lawmakers have already carved up the annual funding so at least $200 million goes for Everglades projects, another $64 million for a reservoir in the Everglades Agricultural Area south of Lake Okeechobee and $5 million to the St. Johns River Water Management District for projects dedicated to the restoration of Lake Apopka. The water management district would also oversee the money for the St. Johns River under the proposal (SB 204) sponsored by Environmental Preservation and Conservation Chairman Rob Bradley, R-Fleming Island. There is no House version of Bradley’s bill. “It’s important that we allocate in a manner that reflects all parts of the state,” Bradley said. Bradley also has a separate measure (SB 370) that would set aside at least $100 million a year for Florida Forever, the state’s most prominent land-preservation fund. Dividing the trust fund money toward projects and regions through individual bills continues to have support from backers of the 2014 constitutional amendment. Environmental groups are battling the state in court about whether some of the trust-fund money has been improperly diverted from conservation purposes to agency staffing and operational expenses. Latvala’s beach-restoration proposal would revise the Department of Environmental Protection’s grading system for beach projects to account for such things as the availability of federal matching dollars — to offset state costs — and tourism-related economic impact. The state department would also be required to update a three-year list of projects quarterly, rather than annually. Rep. Kathleen Peters, R-Treasure Island, has filed a House version (HB 131) of Latvala’s bill. Committee meetings started Monday in advance of the 2018 legislative session, which starts in January. For hundreds of years one of the best expressions of futility was the old saying “Shoveling sand against the tide”. And that was way before rising oceans. But I bet if they knew we were spending $50 Million to do it today while our Libraries close and Schools struggle, our inner cities and country towns look like war zones and our roads crumble, it would become an expression of stupidity. I love the beach. Live in Fl.Stop chasing bad $ w/good only to watch millions of sq. Yards of sand be washed out the next hurricane season. It is a waste of resources. 50 million here 75 million there, what the he’ll, it’s only money.